More than 140 years after the first typewriter was sold commercially in Europe, the epitaph for the writing machine is finally being digitally recorded on millions of PCs across the world. To Jawaharlal Nehru, it was a symbol of independent India. C Rajagopalachari considered it a masterpiece of Swadeshi manufacturing. For the country’s industry, it was a perfect launch pad. But for a slice of what is soon going to be history, this might be the last chance. 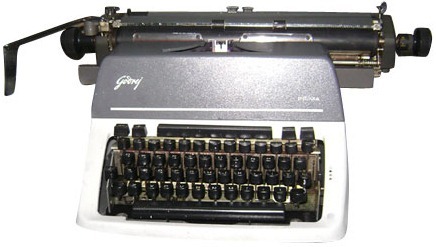 Godrej — the last manufacturer of typewriters in the world — has just 500 machines left for sale. “We stopped production in 2009 and were the last company in the world to manufacture office typewriters. Currently, the company has only 500 machines left. The machines are of Godrej Prima, the last typewriter brand from our company, and will be sold at a maximum retail price of Rs 12,000,” said Milind Dukle, general manager-operations, Godrej & Boyce Manufacturing Company. When the company started making typewriters, the whole nation considered it the first step to an industrialised India. During its golden age in the 1990s, the company used to produce 50,000 machines every year, while the total output in India was about 150,000. “From the early 2000 onwards, computers started dominating. All the manufacturers of office typewriters stopped production, except us. Till 2009, we used to produce 10,000 to 12,000 machines a year,” said Dukle. When the company started its operations in the 1950s, Prime Minister Jawaharlal Nehru mentioned typewriters as a symbol of independent and industrialised India. The major typewriter manufacturers in the world included companies like Remington Rand, Olivetti, Smith-Corona, Adler-Royal, Olympia, Nakajima and Godrej. Once Godrej stopped its production in 2009, its typewriter plant at Shirwal, in Pune, morphed into a refrigerator manufacturing unit. The evolution of typewriters over the years from the 1950s is preserved in the company’s archives at Vikhroli in Mumbai. For those who love the ping of margin bells or are eager to have a piece of history, there are 500 opportunities waiting.